It sure seems like I eat Japanese food almost every week. Well, there are a few reasons for this. 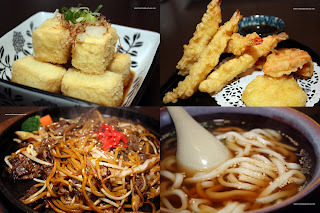 First of all, my son hates almost all types of food except for udon and tempura. Scratch that, only the tempura batter. Second, I convinced myself that Japanese food is healthier. I guess Tempura, Agedashi Tofu and the sort do not qualify. Luckily there seems to be a Japanese restaurant on every other block in the GVRD. Despite the fact there are many to choose from in our neighbourhood, we headed all the way to Kits for our eats today. 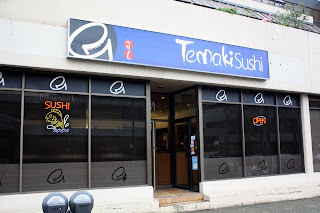 We actually attempted to eat at Temaki Sushi a few weeks ago to no avail since it's closed on Sundays. We were with Guy Smiley and Girl Smiley last time and they joined us again this time to finally try this place out. 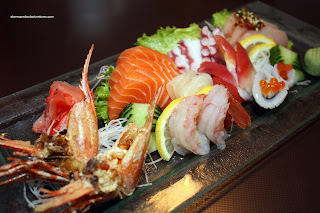 We started with the Deluxe Assorted Sashimi. Presented nicely on a long glass plate, everything looked nice and I particularly liked the fried spot prawn heads. I practically ate the whole darn thing except the razor sharp portion, it was hurting my mouth. All the sashimi on the plate, as you can see, was fresh and nothing was mushy. A real nice beginning to the meal. Served piping hot, the Agedashi Tofu was quite crispy on the outside and decently soft on the inside. I would've preferred a silkier texture; but decent nonetheless. Not resembling tempura batter in texture and appearance, the Tempura itself was actually quite crispy and light. However, with the strange looking batter, it a tad too crispy and didn't take the dipping sauce too well. They Beef Yakisoba arrived on a sizzling hot plate. It was on the saltier side; yet was pretty good. The noodles were just the right chewiness and it was a pleasant eat. The Plain Udon (guess who this was for?) was your typical udon in soup. The soup was a bit plain with no real taste of dashi or mushroom. Although, the noodles were the right consistency in between soft and a bit chewy. We got 2 specialty rolls to try out which were the Dragon Roll and the Chef's Roll. The Dragon Roll consisted of a California Roll with BBQ eel on the outside. 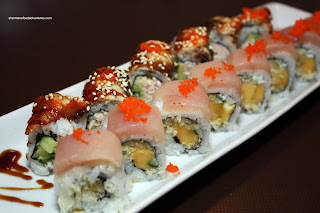 The Chef's Roll had mango, tempura bits and cucumber on the inside while tuna and masago resided on the outside. The best way to describe both rolls is that they were not bad. Nothing particularly exciting about them; however, ingredients seemed fresh while the rice had a nice resistance. 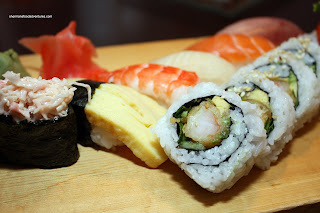 The last item was the Sushi Combo which consisted of a Dynamite Roll and assorted Nigiri. As you can see in the picture, the rice looks pretty good and each item is prepared carefully. Again, nothing mind-blowing; but solid nonetheless. Essentially, that sums it up pretty much. Decent food at reasonable prices. Staff seemed interested in providing good service and the place is decently clean. Mind you, I wouldn't pass up Ajisai, Shiro, Fuji or Toshi in favour of Temaki; but I wouldn't be opposed to visiting again either. wow, that sashimi looks great. i like that they included a few pieces of ikura. nicely presented. the tempura looks a bit strange though... did the batter taste different from most others? The sashimi was good! Fresh, as you can see in the picture. The tempura batter resembled that batter you'd find on onion rings. It was indeed strange. I actually really like Temaki. I used to live right around the corner and would go often. Just make sure to ask for the wild sockeye. ;) Also, next time you go try the Spicy Hotate (spicy mayo and chopped scallop that you roll into nori) - it's super addictive! And...now I have a craving. Will have to visit soon.